The cultural trade show known as the 57th Annual Grammy Awards is now history. 83 golden antiquated media playback device replicas were handed out to some of the most talented musicians in the world. But the event is anything but antiquated. The Grammys have been pushing the boundaries of social and streaming media for some time, improving every year and rivaling events like The Oscars and The Superbowl for social activity. The Grammys know how to create, and amplify, buzz. Though I did not take part in the excellent Grammy social program as I had the past 4 years, I was graciously asked by Entertainment Tonight to live blog the event for ETOnline.com. and I did cover the pre-telecast (rechristened the GRAMMY Awards Premiere Ceremony) at the Twang Nation twitter feed. That’s nearly 8 hours of tweeting, blogging, posting in all. But this is not a social marketing site. Its about the music, and there was lot’s of it. Much of it great. Other notable wins were Mike Farris’ first nomination turned into a win for win for Best Roots Gospel Album. Nickel Creek and Punch Brother founder Chris Thile and bassist Edgar Meyer won the Grammy Award for Best Contemporary Instrumental Album for their album, ‘Bass & Mandolin.’ The duo have been performing together sporadically for more than a decade. ‘Bass & Mandolin’ was also nominated for Best Instrumental Composition for the album track “Tarnation” and Best Engineered Album, Non-Classical. “We started our 18th year of making music together this year, and we want to thank Bob Dylan and Woody Guthrie for lighting the way,” singer/fiddler Ketch Secor said from the podium. Glen Campbell won his sixth Grammy of his extraordinary career for Best Country Song. The ailing country legend won for “I’m Not Gonna Miss You,” the bittersweet song Campbell penned with Julian Raymond for the 2014 documentary ‘Glen Campbell: I’ll Be Me,’ won against songs by Kenny Chesney, Eric Church, Miranda Lambert and Tim McGraw with Faith Hill. Best Historical Album went to the excellent Hank Williams The Garden Spot Programs, 1950. Colin Escott & Cheryl Pawelski, compilation producers; Michael Graves, mastering engineer. winning a Best Rock Album award earlier in the evening (rock?) there’s no arguing that Beck is a musician with an artistic vision, with little apparent care for the charts and industry. A rare vision richly deserving the honor of a high-profile award. Apparently after the win twitter spiked with ‘Who is Beck?’ Supposedly by people genuinely unaware of the artist. The rest was Kanye West. 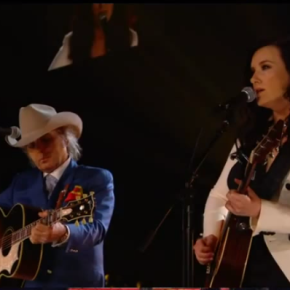 The stand out performance was Best New Artist nominee Brandy Clark sharing the stage with her idol and recent tour mate Dwight Yoakam. 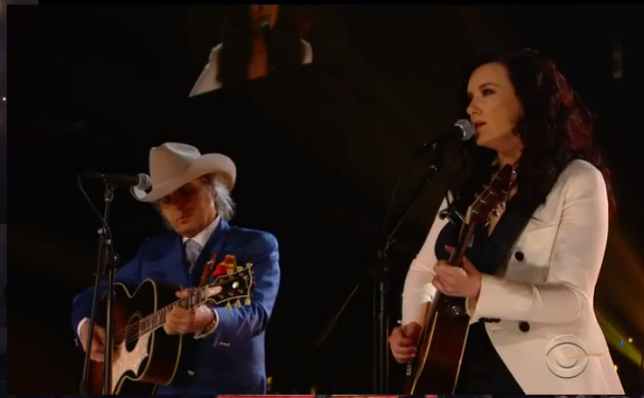 The two performed a lovely rendition of “Hold My Hand” from the Best Country Album nominated ’12 Stories.’ Perched on a round stage with no extravagant light show, two simple guitars and two warm voices. It was the most low-key performance of the 2015 Grammys and the one that best personified what most matters, and is often lost, in theses events.